WORKMASTER® POCKETPATH Hopper Car Connectors are the Industry’s most heavy-duty and cost-effective solution for eliminating the time-consuming, dangerous, and environmentally-harmful job of unloading covered hopper cars. 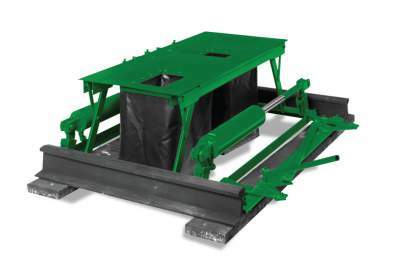 The POCKETPATH hopper car connector solves multiple issues at unloading sites. If wind-blown powder or product dust creates pollution problems, the POCKETPATH has it covered. Additionally, any moisture, dirt or other contaminants won’t be tolerated. It’s also ideal when it’s difficult to control insect or rodent infestation and, therefore, installation can help meet OSHA or EPA guidelines for railcar unloading sites. Finally, the POCKETPATH reduces the chance of worker injury because it eliminates the dangerous practice of climbing under cars to manually clean-out hopper grooves and attach boots. The POCKETPATH Connector is designed to easily install above ground, between the track flanges and below the top of the track rails. Installation can be completed by a 3-man crew in less than 4-hours including attaching the Connector’s funnel boots to the under-track storage or transport system. The Connector then automatically and smoothly rises with a constant 2500 lbs. of sealing force. As the railcar empties it continuously self-adjusts to the railcar’s cant. After unloading the car, reverse the valves to close the funnels and lower the Connector to its rest position beneath the track tops. Total plant air consumed < 3 CFM @ 80 PSI of a filtered, regulated & lubricated air supply. Finally, lock the Control Console’s hinged-lid to prevent unauthorized use and move onto the next job. For unique railcar applications, special modifications, or truck unloading, call WORKMASTER®, toll-free, at 866.476.9217. Dual, heavy-duty air-actuated Spread Cylinders with SS piston rod assemblies assure uniform control of the funnels’ open/close cycling. Dual, 4″ Dia heavy-duty, air-actuated hydraulic Lift Cylinders with polished chrome piston rod assemblies assure smooth, automatic, positive sealing. Locking Adjustment stops on the side-mounted Spread Rod Guide to assure an accurate, consistent, funnel-to-pocket alignment. Nylon Bushed Moving Parts assure friction-free operation, long life, and minimal, easy-to-perform maintenance. Custom-made, Flexible Boots assure the Boot fabric and dimensions are matched to each application. Baked-On Powder Coat Finish and SS Fasteners ensure the Connector will withstand harsh environments. Replaceable, High-Density Foam Seals assure a dust tight pocket-to-funnel connection.